Have you been searching for a way to take your life on the road but do not have an oversized truck to do it? If so then you need to come to your local Airstream dealership in Wisconsin and see one of the many new and used Airstream trailers for sale. That includes a large selection of Airstream Bambi trailers for sale in Wisconsin. Here at Ewald’s Airstream of Wisconsin, we have a large selection of new and used cars for sale with everything from the Airstream Nest for sale, to the Airstream Flying Cloud for sale and everything in between here in Franklin, WI. At this Airstream dealer in Wisconsin, we also have a team of people who are happy to answer any and all questions you may have about one of the many new and used Airstream for sale. That includes questions about the all-new Airstream Nest for sale here in Franklin, WI. This Airstream travel trailer comes with many features both inside and out that you will not want to miss. Not only that but with this Airstream trailer for sale is unlike any of the past travel trailers. 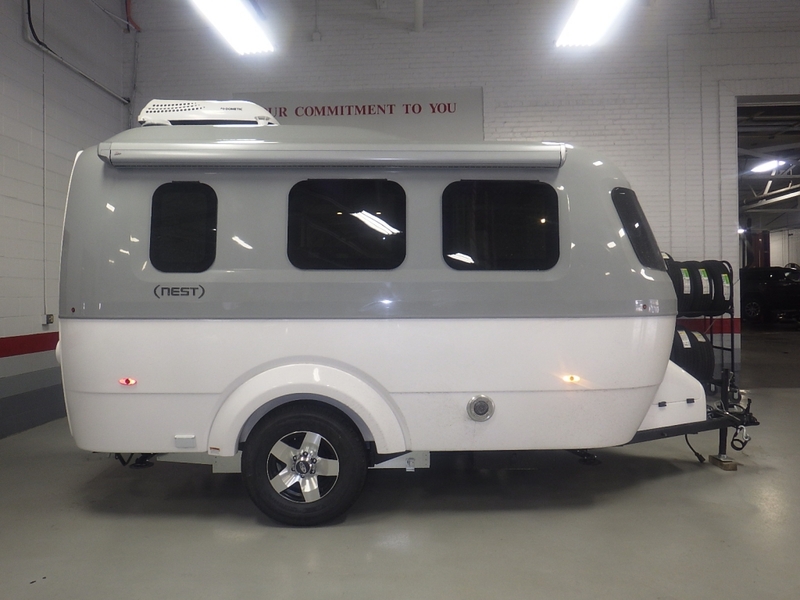 Being the first fiberglass travel trailer available in the Airstream lineup, the Airstream Nest for sale is made of gleaming fiberglass with a two-tone gel-coat. The Gel coat offers impressive durability so you will never have to worry about cracking or denting when you haul this travel trailer for sale. The Airstream Nest is made for those seeking to get lost in the wonders of nature, with panoramic windows and bright accent colors you will feel right at home in this Airstream Bambi camper. This Airstream camper for sale is the perfect fit for anyone who is looking for a new adventure while enjoying a modern design. With two impressive layouts, you can have all of the storage space and sleeping accommodations you can dream of when it comes to this Airstream trailer for sale. 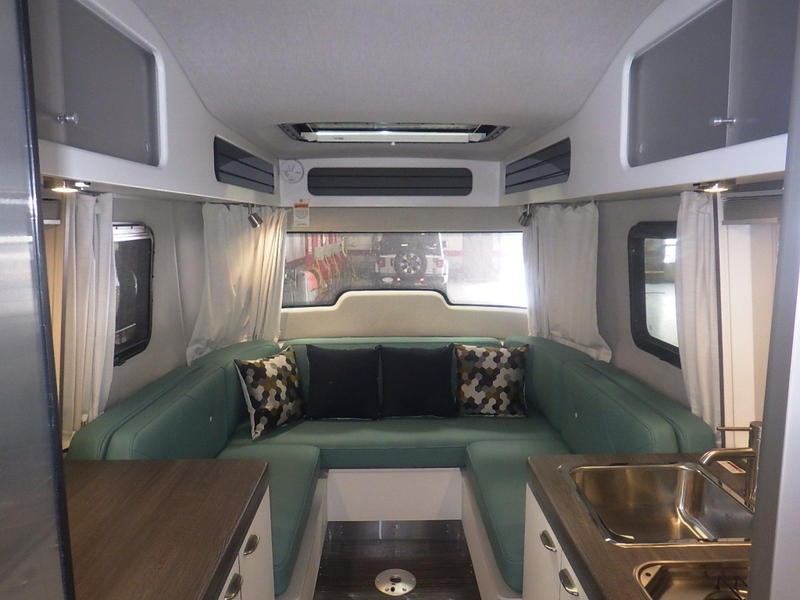 These travel trailers for sale come with the optional U-shaped dinette that converts into a sleeping area, or a fixed queen size mattress, each layout will suit your wants and needs perfectly. Relax in modern comfort with seamless vinyl flooring and Italian cabinetry. Bright pops of color throughout this Airstream for sale make it the perfect complement to the beauty of the landscape around you. The Airstream Nest for sale also comes with panoramic windows that let light stream in from every direction making your Airstream Bambi feel like and bright. This Airstream for sale also comes with a built-in remote powered blackout shades give you total privacy when you want and need it. The Airstream Nest also comes with features such as dedicated exterior storage space, exterior LED lights, and a galley style kitchen. You can count this Airstream to be easy to haul across the country with its aerodynamic frame and teardrop shaped body. Come to your local Airstream dealership in Wisconsin and see one of the many new and used Airstream for sale like an Airstream Bambi for sale. Here at Ewald’s Airstream of Wisconsin, we have a variety of Airstream trailers for sale to choose from here in Franklin, WI. When you are looking for an Airstream dealership near you, come to Ewald’s Airstream of Wisconsin at 6269 S 108th St, Franklin, WI 53132.